Today I would like to comment on what is going on in Mexico and, by now, several other countries, including Spain, the UK and Germany. I am concerned mainly about my family in the U.S. and my buddy Sherlock and her husband (currently in southern California), but my thoughts are also with those of you who live in the affected areas. avoid shaking hands with people. don’t cough or sneeze into your hands (never!) but rather onto your sleeve. the most important thing is to wash your hands thoroughly and frequently, especially after returning home from an errand or whatnot. Some time ago, I read a very useful suggestion posted by a myeloma list member: as you wash your hands, sing “Happy Birthday” to yourself. That silly little song lasts exactly the amount of time recommended for a thorough hand-washing. I have been using this technique for quite some time, now, regardless of the season: “Happy Birthday to me, Happy Birthday to me, Happy Birthday dear meeeee, Happy Birthday to meeee, and Many moreeeeee.” Depending on my mood, I sing it (to myself) in Italian, too…since the language is irrelevant, of course. Italy is not an at-risk country (thus far), so I am not concerned for myself or Stefano. Hmmm, a thought just occurred to me…I haven’t had any tests now in about six months and am finally running out of my feverfew pill supply. For the past several weeks I had been planning to go up to the hospital for my tests…but every time I decided on a particular day, something happened, and I had to postpone. Well, I guess I had better go have my tests done before the virus reaches Italy (as it may or may not). Okay, off to the hospital next week. I will wear a mask…just to be on the safe side. In conclusion, all I can say to all of you who are currently in areas at risk is: please be careful, stay informed (see: http://en.wikipedia.org/wiki/2009_swine_flu_outbreak), wash your hands, laugh to enhance your immunity and, above all, please stay well! Well, we stood our ground for 48 hours, which isn’t bad, all things considered. But last night we surrendered and took the bothersome Elizabethan collar off. Why? Because Priscilla had turned into a terrified tiny larva. She was so frightened of bumping into things that she refused to get off our bed, which meant that we had to carry her downstairs for meals and even to use the cat litter…by the way, she peed all over our feather duvet on Saturday. Lovely. Carrying a kitty around sounds simple enough. But Priscilla is part tiger. Whenever we picked her up, she would growl and hiss, then hold on to our necks for dear life with her sharp little claws embedded in our flesh (OUCH!). Then, yesterday afternoon, Stefano tried to pick her up to take the feline larva downstairs for a bite to eat, and she scratched his neck. Fiercely. Drew blood. A scene out of Rudi’s “how to give a pill” comment. I wonder if any of Stefano’s colleagues at work will make a smart aleck remark about those scratches today. Eh. So yesterday evening we carefully checked out the spot on her tummy, and it looked okay. Concerned that we wouldn’t be able to pick up the ferocious beast anymore and that, as a result, she would starve to death, die of thirst AND pee all over our duvet (I am joking here, naturellement, we would never let that happen! ), we decided to unhook her. Funny thing is, even after being released from the torture device, she wouldn’t budge from our bed. We called and cooed to her, but she didn’t come down for dinner with the others. So I took a bowl of food upstairs and showed it to her at a distance (she was starving by then). Step by step, going backwards, I managed to coax her slowly downstairs. Once she realized that she wasn’t ramming into the furniture and walls anymore, she was fine. She slept by my feet or perched precariously on my shoulder (…) all night and then, just before dawn, thrust her purring face into mine, demanding attention. Life seems to be back to normal…so I hope! I have to say that we have noticed her licking that pink hairless spot on her tummy (now that she can reach it…). Of course, we discourage that. But we aren’t with her all the time, of course…oh well. At any rate, one thing is for sure: no more e-collar. Ever. P.S. Our cats are housecats. So Priscilla’s alopecia was not caused by parasites or fleas. Just to make sure, though, our vet checked her over carefully on Friday…found nothing. I was up for hours last night with my 4-year-old kitty, Priscilla. I am exhausted. So is she. This is what happened: a couple of afternoons ago, Priscilla was sleeping on our bed with a couple of our other cats. As usual. When I walked into the room at one point, she turned over on her back and stretched out…and I stopped for a second to scratch her tummy. Almost immediately I noticed an area that had no hair on it. A hairless pink spot. YIKES! I called the vet immediately and made an appointment for the following day (=yesterday). At any rate, the vet prescribed an Elizabethan collar (this horrible contraption prevents her from licking the sore spot on her tummy) and an antibiotic…now, have you ever given an antibiotic to a fierce tiger in the wild? Well, that’s what we are going to do in about a half hour. In fact, I asked the vet yesterday if I could wear the e-collar and take the antibiotic instead of Priscilla, but apparently it doesn’t work that way. Sigh. So, okay, we are being strong. Not easy, I tell ya! But, after my restless night (I should note that while I was up and down the stairs following a very noisy and distraught Priscilla, Stefano was fast asleep…no comment…! ), in mid morning, when Priscilla calmed down a bit and I finally went back to bed, Stefano managed to give her a bite to eat and some water. Such a relief. Anyway, if I don’t post much in the next few days or answer your e-mails, at least you know that I am either trying to console my unhappy cat or giving her a pill. Ma porca miseria, questa non ci voleva! Update: I had no problem giving Priscilla the antibiotic just now. I crunched it up and mixed it with a dab of the fur ball remover gunk that all my cats adore (with the exception of Puzzola, our eldest). She licked my finger clean. Phew! A blog reader and myeloma list patient, whom I will call TAB from now on, contacted me recently, telling me that he had written a report about his case of smoldering myeloma. He asked if I could add the report to my blog. Unfortunately, I cannot. The least I can do, though, is write a “summarizing” post about it. P.S. TAB’s report is now publicly available on my blog (see my August 2012 posts). You can also write to him. Here is the relevant link: http://margaret.healthblogs.org/good-or-bad-for-myeloma/smoldering-for-14-years-tabs-story/ Please note that I no longer send his report to individual readers, since it is available on the blog now. Thanks! UPDATED in the fall of 2012. The study focuses on a series of tests carried out on curcumin and turmeric by a team of Oklahoma researchers. I extracted what I consider to be a few interesting bits. Here is something that any curcumin “experimenter” knows: Curcumin is practically not soluble in water at neutral or acidic pH. But the Discussion part adds that, while most of the curcumin tested did remain insoluble in water (98.5% for curcumin and 94.7% for turmeric), there was a slight increase in solubility when heat was added: from 0.21% to 2.6% with curcumin and 1.7% to 5.3% with turmeric. Not much, certainly. The researchers believe that the water-soluble curcumin has the potential to enhance the pharmacological utility of curcumin, and this factor should be considered in clinical trials involving curcumin. HNE modification of protein could be a way in which curcumin exerts its effect. This report deals with (1) development of procedures designed to improve solubility of curcumin, (2) development of a simple detection method for curcumin, and (3) testing the pharmacological utility of the solubilised curcumin using an in vitro assay. In these tests, curcumin became 12 times more soluble when heated. Turmeric, in comparison, became only 3 times as soluble. A really important point: the heating procedure did not affect curcumin stability. […] The heat treatment did not cause the curcumin to disintegrate […]. In fact, Heat treatment actually appears to protect curcumin from breaking down faster. That is a bit of more good news. Well, ok, we actually knew this from the abstract, which states that there was no significant heat-mediated disintegration of curcumin. Discussion part: Increasing evidence points to the involvement of oxidative stress in the pathogenesis of several diseases. Curcumin is very attractive on account of the fact that it can intercept potent carcinogens such as reactive oxygen species. Of special interest is the ability of curcumin to neutralize these dangerous free radical species. Curcumin has been shown to have antimicrobial and antiprotozoal activity, antimalarial, anti-angiogenic, and antitumor effects and a variety of other biological effects. Two of this study’s authors recently wrote a letter to the Editor of “Clinical Cancer Research” (grazie, Sherlock, and thanks also to a blog reader) urging for heat-solubilized curcumin to be tested in clinical trials. Based on the results of the Phase II clinical trial of curcumin in patients with advanced pancreatic cancer (see my Page on this topic), they suggest that the bioavailability of curcumin could be increased before oral administration to patients. Thanks for all the answers, both private and public, to my April 17 post. That evening, I asked Stefano the very same question. His answer: “at home, in my own bed,” just like many of the folks in the videos. 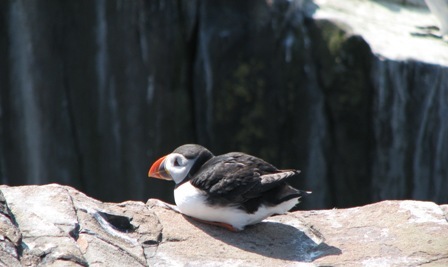 And here is my response: I would like to wake up surrounded by puffins. You see, the few hours that Stefano and I spent last year on the Farne Islands (Northumberland, UK) were absolutely magical. I have had few comparable experiences in my entire life. And now, whenever I want to think a blissfully happy thought, my mind almost always wanders back to the Farne Islands and those adorable seabirds. It’s a rather long story, which I will do my best to shorten. A few months ago Stefano and I began thinking about how we would like to celebrate our upcoming 10th wedding anniversary (…and what we could afford!). We went through various options: a weekend in Paris, London or Prague…a long weekend hiking through one of Italy’s national parks…and so on. Then we remembered a place that a blog reader/friend told me about last year: Skomer Island, Pembrokeshire, UK. 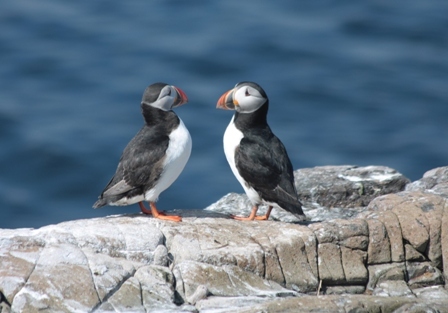 While it hosts one of the most spectacular and accessible seabird colonies in Europe, this island is perhaps most famous for its large puffin population. You can visit Skomer during the day, but there is also overnight accommodation for a restricted number of people, 15 at the most. Well, Stefano and I, puffin maniacs that we are, decided that we wanted to spend at least one night on the island: our idea of the perfect anniversary! Many weeks later, out of the blue, Stefano asked me to phone the Wildlife Trust to see about booking an overnight stay on Skomer for next year. So I did. And, lo and behold, I was told that the Trust had JUST received a cancellation for one night in early July. How coincidental is that? Needless to say, Stefano and I grabbed those two unexpectedly vacant spots. My wish has been granted. Puffin darlings, here we come…! A couple of blog readers (thanks!) sent me this link: http://tinyurl.com/c49rgl Extraordinary…brought tears to my eyes…well, I hope you enjoy watching this as much as I did! My cousin (thanks!) sent me the links to two videos that I found absolutely fascinating. One was filmed in Brooklyn, U.S.A., the other in London, UK. The idea behind the two films was quite simple: stop and ask 50 people the exact same question and film their answers. This is the question: where would you like to wake up tomorrow morning? I loved watching how people reacted, even though I thought the films could have been speeded up a bit (but perhaps therein lay their charm…). I am going to wait a bit before telling you what my answer would have been, had I been asked that question…I am very curious to know your answers first, so please leave me a comment or send me a private note. Just write down the first thing that pops into your mind…as I did. Here is the London link, by the way: http://fiftypeopleonequestion.com/locations/4-london-uk. From there you can click on the Brooklyn link.